Join Alexis for fun Girls Night Out mat yoga workshop! Suitable for all fitness levels. Power/Vinyasa fusion format. Martini Freeze Pops and socializing to follow! Please enroll each person separately! Purchasing more than 1 ticket does not enroll more than 1 person! Join Nicole in a guided meditation as you float weightlessly in an aerial hammock, releasing mental and physical stress from the week. There is no physical movement in this workshop. Space is limited; advanced sign up required. Weight limit = 300lbs. Minimum age = 15 y/o. 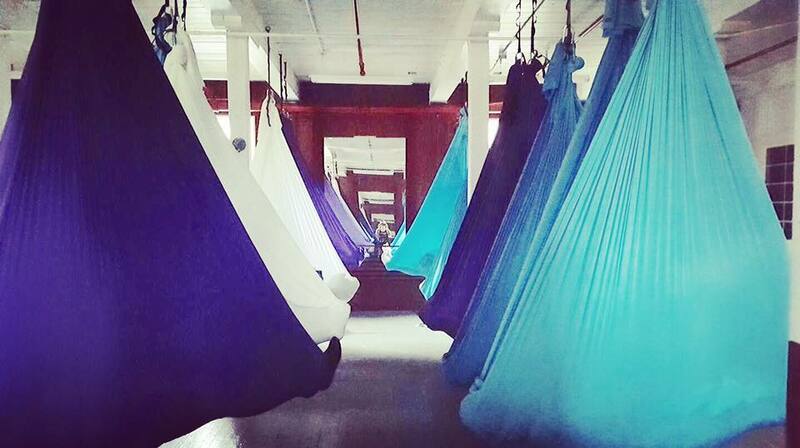 Floating is a multi-sensory meditation practiced in a hammock. Deep relaxation is known to reduce blood pressure, stress and improve sleep. You will be guided through the practice, using techniques that take you into almost a “dream like” state, while still fully awake. There is no physical movement in this workshop.